Today we celebrate the birth of Mary. “This radiant and manifest coming of God to men most certainly needed a joyful prelude to introduce the great gift of salvation to us. The present festival, the birth of the Mother of God, is the prelude, while the final act is the fore-ordained union of the Word with flesh. Today the Virgin is born, tended and formed and prepared for her role as Mother of God, who is the universal King of the ages. 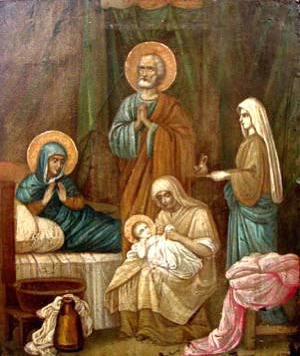 Read more on the Nativity of the Blessed Virgin Mary here. This entry was posted in Blessed Virgin Mary, Catholic Church and tagged Feast days of the Church. Bookmark the permalink.